William Romaine Newbold was born in Wilmington, Delaware, on November 20, 1865, to William Allibone Newbold and Martha Smith Baily. Newbold attended the Cheltenham Military Academy in suburban Philadelphia. 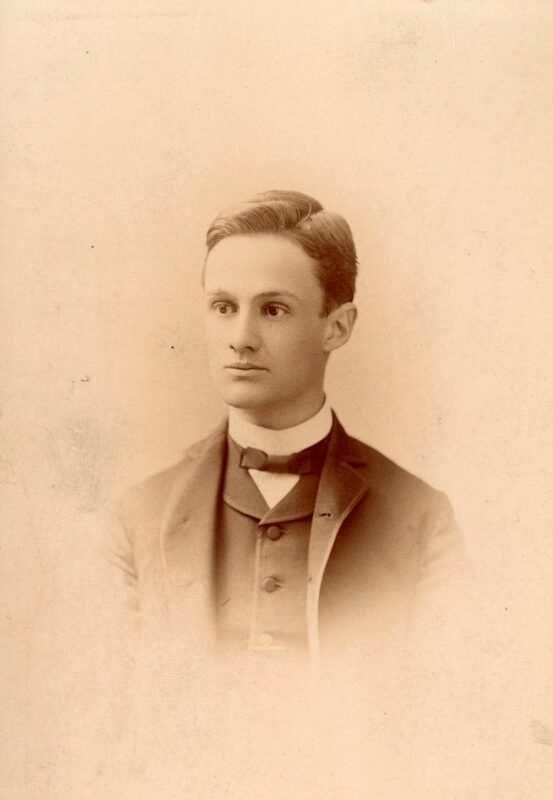 He enrolled at the University of Pennsylvania in the fall of 1884 as a sophomore with the Class of 1887. Newbold was an honors student during each of his undergraduate years and quickly distinguished himself as an academic talent, graduating with prizes in both Latin and philosophy. Newbold even taught an informal class on Hebrew in only his second semester on campus. He was also a member of the Senior Book Committee and the Philosophical Seminar. After earning a Bachelor of Arts degree, Newbold returned to the Cheltenham Military Academy where he taught Latin while simultaneously working toward a doctoral degree at the University of Pennsylvania. In 1889 Newbold left the military academy to join the faculty of the University of Pennsylvania as an instructor in Latin. The following year, Newbold was named lecturer in philosophy while he maintained his position as instructor in Latin. He earned his Ph.D. in 1891 with a dissertation entitled, “Prolegomena to a Theory of Belief.” After earning his Ph.D., Newbold temporarily left the University to study in Germany at the University of Berlin. Newbold returned to the United States and the University of Pennsylvania in 1892 and resumed his positions as an instructor in Latin and a lecturer in philosophy. In 1894, he was promoted to assistant professor of Latin. Two years later, in 1896, he was named the dean of the Graduate School. During his tenure as dean, Newbold worked to elevate the status and prestige of the Graduate School by raising the admissions standards and improving administrative aspects. In 1903 Newbold was promoted to professor of philosophy and in 1907 he was named the Adam Seybert Professor of Intellectual and Moral Philosophy. He was named an honorary member of the Philomathean Society during that body’s centennial celebration in 1913. During World War I, Newbold taught the political and historical causes of the war to the Reserve Officers Training Corps. The University honored Newbold with an honorary Doctor of Laws degree (LL.D.) in 1921. Newbold’s passions throughout his lifetime were all things ancient and mysterious. In the late 1890s he became interested in the psychology of religion and researched the topic to great extent, writing a series of papers on hypnosis, hallucinations, telepathy, and trances and how they related to religious experiences. He was a member of the Society for Psychical Research and served as the psychology editor of the American Naturalist for one year, 1895-1896. In the early 20th century he turned his attention to ancient Greek philosophy. He translated many works by Aristotle and Plotinus, but for unknown reasons never submitted them for publication. He did however publish a well-received paper on the philosopher Philolaus in 1905. Following World War I, Newbold turned his interests towards early Christian theology. In 1920 he delivered a series of lectures on Valentinian Gnosticism in Philadelphia at the Bohlen Foundation Lectureship, an annual series of lectures on Christian themes delivered at the Church of the Holy Trinity. Newbold’s body of knowledge on early Christian theology became so great that at one point in the 1920s the Episcopal Theological Seminary of New York offered him a position as a chair of ecclesiastical history. Though the offer was considered a great honor for a layperson, Newbold chose to remain at the University of Pennsylvania. Newbold also had a great interest in puzzles, codes, and cryptography. This interest led to the last major undertaking of his professional life. He worked to decipher a famous coded text, commonly referred to as the Voynich Manuscript. He believed it had been written by Roger Bacon, a thirteenth century English monk, scientist, astrologer, and inventor. According to Newbold’s complex system for deciphering the code, Bacon had made numerous scientific discoveries which no one else would “rediscover” for centuries. Newbold dies before he could decipher the whole manuscript, but the partial decipherment was published posthumously as The Cipher of Roger Bacon (1928). In the years immediately following Newbold’s death, his version of the meaning of the code in the Voynich Manuscript was seen as the truth. Several years later, however, other experts began to look at Newbold’s method with a critical eye. They correctly noted that his system was faulty as it was based on a number of unproven hypotheses. Newbold’s interpretation of the Voynich Manuscript was eventually completely disregarded, with some experts even questioning if Roger Bacon was the author of the manuscript. None of these questions regarding the validity of his decipherment surfaced during his lifetime. William Romaine Newbold died on September 8, 1926. A memorial service was held for him in College Hall on the University of Pennsylvania campus. He was survived by his wife Ethel Sprague Kent Packard, whom he had married in 1896.